When setting up a good filing system, one of the most important decisions you make is the indexing method you will use to identify each file. 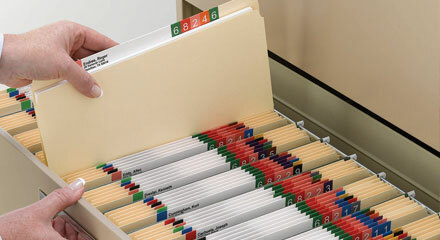 What should be on the file label to identify it in the file drawer or on the shelf? Smead Organomics calls these the Finders; file headings, names, account numbers, transaction dates, category names, etc. What you use as the primary document indexing for your files depends on the nature of the documents, your workflow processes, the amount of files in your system and the number of people who need to access the files. It usually comes down to a choice of filing by a name (alphabetic indexing) or a number (numeric indexing). Each has its own advantages, and Smead Organomics has filing solutions for both indexing methods that help users find files quickly and avoid costly misfiled records. Indexing alphabetically is easy to learn because anyone who can read knows the order of letters in the alphabet. Filing by a name is also very intuitive. You know you have the right file simply be reading its heading. Unlike numeric indexing, no cross-reference system is needed, so users of the system can find files simply by looking them up in the filing system. A file with an alphabetic heading is also easier to identify when it’s out of the file system and in use. There are disadvantages to alphabetic filing when the number of files grows to several thousand. The more files you have, the greater risk of having the same name on more than one file. There is also a higher risk of misfiled records if users don’t follow certain rules for alphabetizing, such as filing by a person’s last name, or ignoring the word “The” at the beginning of business names or titles. An essential component of any numeric system is the cross-reference index. Users must have a way to look up file numbers quickly and make sure they are indeed the records that they need. The numbers are often assigned or tracked by computer software, which makes it easy to identify the records you want through search queries and sorting. Certain industries use numbers for security and privacy issues, such as keeping medical or financial information confidential. 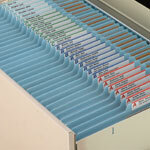 Consider each indexing method when designing your filing system. Weigh their pros and cons against the way you use documents at your office. 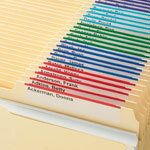 Whichever you choose, there is a Smead Organomics filing solution that can help your personnel be more productive.